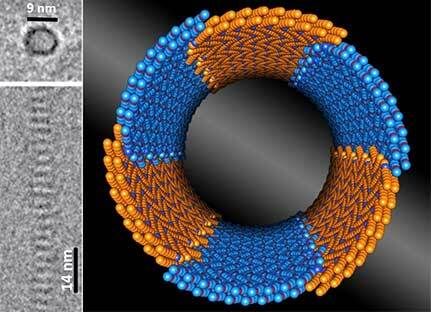 (Nanowerk News) Uniform tiny tubes could change devices as diverse as cell phone batteries and water purifiers. The challenge is making the tubes the same. Scientists discovered a family of nature-inspired synthetic materials; when placed in water, the material spontaneously assembles into millions of long, hollow tubes (PNAS, "Self-assembly of crystalline nanotubes from monodisperse amphiphilic diblock copolypeptoid tiles"). The team rewrote how certain molecules can form. They challenged well-established paradigms by creating open structures with exposed water-repelling and -attracting sections in water. This discovery is scalable. It can produce millions of tubes. These tubes can transport water-fearing molecules and ions for applications including water purification, rechargeable batteries, and cancer-fighting drug delivery. The self-assembly of complex molecules containing water-attracting (hydrophilic) and water-repelling (hydrophobic) segments in water is important across many scientific disciplines. Surfactants are surface-active agents widely used in the chemical industry to control the interface between liquids or a solid and a liquid. Surfactants aggregate to give either spherical or cylindrical molecular structures with collapsed hydrophobic cores and hydrophilic outer surfaces when exposed to water. Similarly, proteins fold in three-dimensional structures with hydrophobic cores in the interior and hydrophilic groups in the exterior. In contrast, the molecular peptoid structures, a nature-inspired synthetic material, synthesized in this research at Lawrence Berkeley National Laboratory consist of hollow rings stacked to produce a tube. The key to verifying the formation of nanotubes is cryo-electron microscopy which imaged 50 of the nanotubes showing the diameter of each tube is relatively uniform along its length, as well as from tube to tube. This work suggests that flexible, low–molecular-weight sequence-defined polymers can serve as molecular tile units that can assemble into precision supramolecular architectures. How exactly these nanotubes form has yet to be determined. However, this latest research sheds light on their structure and hints at a new design principle for building nanotubes and other complex nanostructures. This kind of precision manufacturing is needed to create the nanotechnologies of tomorrow.